Grape is the common name for any of the woody, vining plants belonging to the about 60 species comprising the genus Vitis in the flowering plant family Vitaceae. It is also the name for the edible fruit that grows on these perennial and deciduous plants. Some consider grape a common term for all members of the family Vitaceae. The fruits (grapes) can be eaten raw or used for making jam, grape juice, jelly, wine, and grape seed oil. The widely cultivated Vitis vinifera, the common grape vine, which is native to the Mediterranean region, central Europe, and southwestern Asia, is one of the oldest cultivated plants, with records to 4000 B.C.E. in Egypt (Bender and Bender 2005), and it is frequently mentioned in the Bible. Human creativity is apparent in the numerous cultivars of grapes created by people, as well as the many uses of the fruit that have been invented. Grapes not only provide commercial, aesthetic, and nutritional values for humans but also benefit the ecosystem by serving as food for various insects and birds. The study and cultivation of grapevines is called viticulture. Vitis is a genus comprising about 60 species of vining plants in the dicotyledonous flowering plant family Vitaceae. The family name, which is derived from the genus Vitis, sometimes appears as Vitidaceae, but Vitaceae is a conserved name and therefore has priority over both Vitidaceae and another name sometimes found in older literature, Ampelidaceae. The Vitis genus is made up of species predominantly from the Northern Hemisphere. Vitaceae are a family of dicotyledonous flowering plants including the grape and Virginia creeper. Vitis is distinguished from other genera of Vitaceae by having petals that remain joined at the tip and detach from the base to fall together as a calyptra or "cap" (Gleason and Britton 1963). The flowers are unisexual or modified to act functionally as unisexual; they are pentamerous (having five sets of flower parts) with a hypogynous disk (a receptacle below the ovary that supports such floral parts as petals, sepals, and stamens). Calyx (the sepals combined) is greatly reduced or nonexistent in most species and the petals are joined at the summit into one unit but separated at the base. Flower buds are formed later in the growing season and over winter for blooming in spring of the next year. Two types of flowers are produced: sterile flowers with five long filaments, and erect stamens with undeveloped pistils; and fertile flowers with well-developed pistils and five undeveloped reflexed stamens. The fruit is a berry, ovid in shape and juicy (Gleason and Britton 1963). In the wild, all species of Vitis are normally dioecious (unisexual), but under domestication, variants with perfect flowers (having both male and female parts) appear to have been selected. Most Vitis species have 38 chromosomes (n=19), but there are 40 (n=20) in subgenus Muscadinia. In that respect the Muscadinia are the same as such other Vitaceae as Ampelocissus, Parthenocissus, and Ampelopsis. Most Vitis species are found in the temperate regions of the Northern Hemisphere in North America and Asia with a few in the tropics. The wine grape Vitis vinifera originated in southern Europe and southwestern Asia. The species occur in widely different geographical areas and show a great diversity of form. However they are sufficiently closely related to allow easy interbreeding and the resultant interspecific hybrids are invariably fertile and vigorous. Thus the concept of a species is less well defined and more likely represents the identification of different ecotypes of Vitis that have evolved in distinct geographical and environmental circumstances. Vitis vinifera, the European grapevine; native to the Mediterranean and Central Asia. 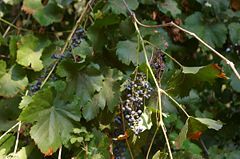 Vitis labrusca, the fox grapevine, the North American table and grape juice grapevines, sometimes used for wine; native to the Eastern United States and Canada. Vitis riparia, the Riverbank grapevine, a wild vine of North America, sometimes used for winemaking and for jam; native to the entire Eastern United States and north to Quebec. Vitis rotundifolia (syn. Muscadinia rotundifolia), the Muscadine, used for jams and wine; native to the Southeastern United States from Delaware to the Gulf of Mexico. Vitis vulpina, frost grape; native to the Midwest east to the coast up through New York. Vitis coignetiae, crimson glory vine, a species from East Asia grown as an ornamental plant for its crimson autumn foliage. Vitis amurensis, most important Asian species. The sea grape Coccoloba uvifera is not a true grape since it is actually a member of the buckwheat family Polygonaceae. It is native to the islands of the Caribbean. Hybrid grapes also exist, and these are primarily crosses between V. vinifera and one or more of V. labrusca, V. riparia, or V. aestivalis. Hybrids tend to be less susceptible to frost and disease (notably phylloxera), but wine from some hybrids may have a little of the characteristic "foxy" taste of V. labrusca. 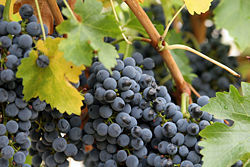 Grapes grow in clusters of 6 to 300, and can be black, blue, golden, green, purple, red, pink, brown, peach, or white. 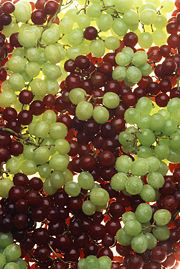 White grapes are evolutionarily derived from the red grape. Mutations in two regulatory genes turn off production of anthocyanin, which is responsible for the color of the red grape (Walker et al. 2007). According to the 2002 report of the Food and Agriculture Organization, 75,866 square kilometers (29,291 square miles) of the world is dedicated to grapes. Approximately 71 percent of world grape production is used for wine, 27 percent as fresh fruit, and 2 percent as dried fruit. A portion of grape production goes to producing grape juice to be used as a sweetener for fruits canned "with no added sugar" and "100 percent natural." The area dedicated to vineyards is increasing by about 2 percent per year. Seedlessness is a highly desirable subjective quality in table grape selection, and seedless cultivars now make up the overwhelming majority of table grape plantings. 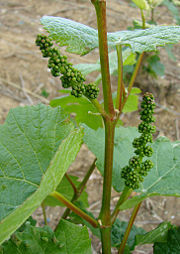 Because grapevines are vegetatively propagated by cuttings, the lack of seeds does not present a problem for reproduction. It is, however, an issue for breeders, who must either use a seeded variety as the female parent or rescue embryos early in development using tissue culture techniques. There are several sources of the seedlessness trait, and essentially all commercial cultivators get it from one of three sources: Thompson seedless, Russian seedless, and black monukka. All are cultivars of Vitis vinifera. Contrary to the improved eating quality of seedlessness is the loss of potential health benefits provided by the enriched phytochemical content of grape seeds (Shi et al. 2003; Parry et al. 2006). The of grapes in Neolithic times was substantiated by the discovery of 7,000 year-old wine storage jars in present-day Georgia in 1996 (Berkowitz 1996). Further evidence shows the Mesopotamians and Ancient Egyptians had vine plantations and wine-making skills. Using the sap of grapevines, European folk healers claimed to cure skin and eye diseases. Other historical uses include the leaves being used to stop bleeding, pain, and inflammation of hemorrhoids. For treating sore throats, unripe grapes were used, and raisins were given as treatments for consumption (tuberculosis), constipation, and thirst. For the treatment of cancer, cholera, smallpox, nausea, skin and eye infections as well as kidney and liver diseases, ripe grapes were used. Today, various health benefits have been attributed to consumption of grapes. Comparing diets among Western countries, researchers have discovered that although the French tend to eat higher levels of animal fat, surprisingly the incidence of heart disease remains low in France. This phenomenon has been named the French Paradox. There is speculation that one explanation could be the greater consumption of red wine in France. Something in the grape helps to lower cholesterol levels in the body and thus slows the build up of deposits in the arteries. Doctors do not recommend excessive consumption of red wine, however, because of other problems related to consumption of alcohol. Compounds such as resveratrol (a polyphenol antioxidant) have been discovered in grapes and these have been positively linked to fighting cancer, heart disease, degenerative nerve disease, and other ailments. Resveratrol is produced by several plants, apparently for its antifungal properties. Resveratrol has been shown to modulate the metabolism of lipids, and to inhibit the oxidation of low-density lipoproteins and the aggregation of platelets (Chan and Delucchi 2000). Resveratrol is found in widely varying amounts in grapes, primarily in the skins and seeds. For instance, the skin and seeds of muscadine grapes have about one hundred times the concentration as the pulp (LeBlanc 2005). Red or not, grapes of all colors offer comparable benefits. Fresh grape skin contains about 50 to 100 micrograms of resveratrol per gram. The amount found in grape skins also varies with the grape cultivar, its geographic origin, and exposure to fungal infection. Red wine offers health benefits not found in white wine, because many of the beneficial compounds are found in the skins of the grapes, and only red wine is fermented with the skins. The amount of fermentation time a wine spends in contact with grape skins is an important determinant of its resveratrol content (PBRC 2005). Ordinary non-muscadine red wine contains between 0.2 and 5.8 mg/L (Gu et al. 1999), depending on the grape variety, while white wine has much less. (Because red wine is fermented with the skins, it allows the wine to absorb the resveratrol. White wine is fermented after the skin has been removed.) Wines produced from muscadine grapes, however, both red and white, may contain more than 40 mg/L (Ector et al. 1996; LeBlanc 2005). Seedless grape varieties were developed to appeal to consumers, but researchers are now discovering that many of the healthful properties of grapes may actually come from the seeds themselves. Since the 1980s, biochemical and medical studies have demonstrated powerful antioxidant properties of grape seed oligomeric proanthocyanidins (Bagchi et al. 2000). Together with tannins, polyphenols, and polyunsaturated fatty acids, these seed constituents display inhibitory activities against several experimental disease models, including cancer, heart failure, and other disorders of oxidative stress (Agarwal et al. 2002; Bagchi et al. 2003). Grape seed oil, from the crushed seeds, is used for its perceived wide range of health benefits. All links retrieved November 9, 2007. Agarwal, C., R. P. Singh, and R. Agarwal. 2002. Grape seed extract induces apoptotic death of human prostate carcinoma DU145 cells via caspases activation accompanied by dissipation of mitochondrial membrane potential and cytochrome c release. Carcinogenesis 23(11): 1869–1876. Bagchi, D., M. Bagchi, S. J. Stohs, D. K. Das, S. D. Ray, C. A. Kuszynski, S. S. Joshi, and H. G. Pruess. 2000. Free radicals and grape seed proanthocyanidin extract: Importance in human health and disease prevention. Toxicology 148(2–3): 187–197. Bagchi, D., C. K. Sen, S. D. Ray, D. K. Das, M. Bagchi, H. G. Preuss, and J. A. Vinson. 2003. Molecular mechanisms of cardioprotection by a novel grape seed proanthocyanidin extract. Mutat Res. 523–524: 87–97. Berkowitz, M. 1996. World's earliest wine. Archaeology 49(5). Chan, W. K., and A. B. Delucchi. 2000. Resveratrol, a red wine constituent, is a mechanism-based inactivator of cytochrome P450 3A4. Life Sci 67(25): 3103–3112. Ector, B. J., J. B. Magee, C. P. Hegwood, and M. J. Coign. 1996. Resveratrol concentration in muscadine berries, juice, pomace, purees, seeds, and wines. Am. J. Enol. Vitic. 47(1): 57–62. Eijkhoff, P. 2000. Wine in China; Its history and contemporary developments. Eykhoff.nl. Food and Agricultural Organization (FAO). 2002. Situation report and statistics for the world vitivinicultural sector in 2002. FAO. Galet, P. 2000. Dictionnaire Encyclopédique des Cépages. Hachette Pratique. ISBN 2012363318. Gleason, H. A., and N. L. Britton. 1963. The New Britton and Brown Illustrated Flora of the Northeastern United States and Adjacent Canada. New York: Published for the New York Botanical Garden by Hafner Pub. Gu, X., L. Creasy, A. Kester, et al. 1999. Capillary electrophoretic determination of resveratrol in wines. J Agric Food Chem 47: 3323–3277. LeBlanc, M. R. 2005. Cultivar, juice extraction, ultraviolet irradiation and storage influence the stilbene content of muscadine grapes (Vitis rotundifolia Michx). Louisiana State University. Parry, J., L. Su, J. Moore, Z. Cheng, M. Luther, J. N. Rao, J. Y. Wang, and L. L. Yu. 2006. Chemical compositions, antioxidant capacities, and antiproliferative activities of selected fruit seed flours. J Agric Food Chem. 54(11): 3773–3778. Pennington Biomedical Research Center (PBRC). 2005. Resveratrol. Pennington Nutrition Series No 7. Plocher, T., G. Rouse, and M. Hart. 2003. Discovering grapes and wine in the far north of China. NorthernWinework. Shi, J., J. Yu, J. E. Pohorly,and Y. Kakuda. 2003. Polyphenolics in grape seeds: Biochemistry and functionality. J Med Food 6(4): 291–299. Walker, A. R., E. Lee, J. Bogs, D. A. McDavid, M. R. Thomas, and S. P. Robinson. 2007. White grapes arose through the mutation of two similar and adjacent regulatory genes. Plant J 49(5): 772–785. PMID 17316172. This page was last modified on 19 August 2008, at 20:04.